Summer is in full swing, and on our tables appear generous and delicious gifts. Now on store shelves or in your own garden, you can easily find fragrant and ripe raspberries. Do not miss the moment and try to cook very tasty and at the same time simple-to-make homemade cake with raspberries. He will have to taste your whole family will be a bright decoration summer table. Carefully rinse the raspberries and the loop, remove all the stalk and dry. Take a deep bowl. Separate the yolks from protein, gently whisk the egg yolks with sugar, add sour cream, butter, baking soda, slaked with vinegar, flour. Thoroughly knead the resulting mass. After the dough will become an even consistency, using a rolling pin roll it to a thickness of about one centimeter. Take a shallow round baking dish or baking pan with high rim, lubricate it inside with margarine or sunflower oil to the dough is not burnt. Lay out a layer of dough in the form so that it reached the top of the form. Take a fork and lightly prick the crust all over the inside surface, then brush it with the egg. Be careful not to pierce all the way through. Place the form with the dough in the oven, preheated to 220-240 degrees. Once the base cakeand lightly browned, remove from the oven. Fill the resulting shape of the raspberries so that it did not reach the top of the cake literally on centimeter. Pour the raspberries a glass of sugar and put back in the oven for another 15-20 minutes. Remove the cake from the oven and let it cool. The surface of the cakeand cover with whipped cream or sour cream, whipped with sugar. Decorate the cake with raspberries and mint leaves. 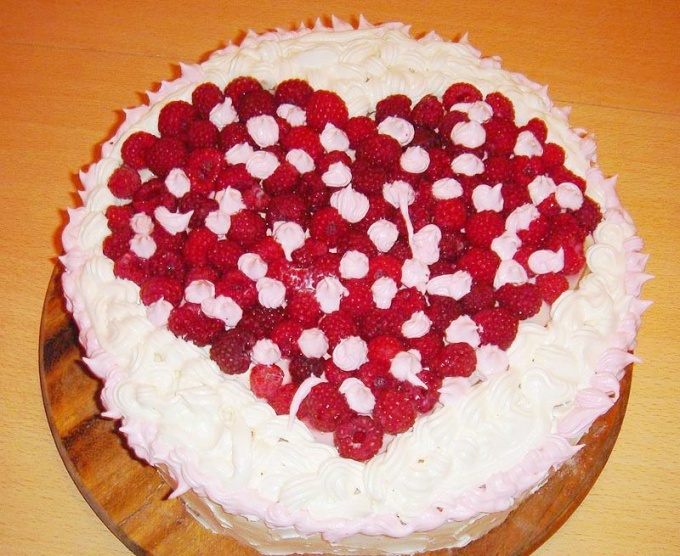 Homemade cake with raspberries ready, we wish you a pleasant appetite! Before you start to knead the dough, sift the flour - this will enrich it with oxygen and will make the dough more fluffy. The dough did not stick to the hands, before kneading, lubricate your hands with sunflower oil.